Milk dumplings smoothered in sugar syrup to make a tasty all time favorite sweet. Now add allichi seeds, baking powder and flour and mix them very well. Now add water which must be cold and try to make a dough, enough hard to make balls. In the mean time mix sugar in water and put it on low heat. Don't make fully prepared sheera at this time. Now fry baals in a pan on low heat very slowly. Other wise they will become hard. 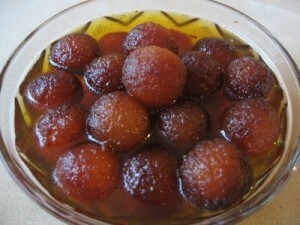 After frying put them togather into the sheera and cook until they absorb the sheera well. Now if you like roll them into the khopra and decorate them with dry fruit. This is really easy and tasty recepie.